Does your child ever have trouble accepting compliments or constructive criticism? 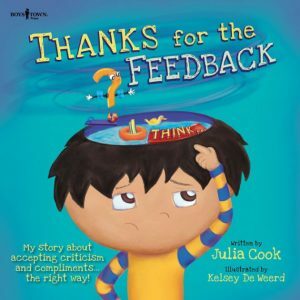 Thanks for the Feedback by Julia Cook helps children overcome that very problem. RJ is a boy who never knows quite what to say. Give him a compliment? He puts himself or the other person down. Give him some helpful feedback? He reacts by blurting out mean words. It’s no wonder that his friends prefer to leave him alone. Thankfully RJ’s parents are able to teach him how to accept compliments and feedback. After all, “Feedback is just information,” right? Children will be able to relate to some of the feedback RJ receives. He does, after all, become a bit restless in class. He moves around too much, talks too loud, and has trouble staying focused. My compliments to illustrator Kelsey De Weerd, who reveals exactly what happens in RJ’s head when he doesn’t know what to say. The illustrations are quite entertaining! Plus, with the added tips for parents and educators at the end of the book, Thanks for the Feedback is a helpful tool for adults and kids alike. Recommended for ages 5-8, though if older children will still benefit from the message, don’t let that stop you. Want to read about another one of Julia Cooks fun character-building books? You’ll find Making Friends is an Art in the complete collection of Children’s Book Finds here.